A few weeks ago I got back from Nepal, where I did a 15-day trek* in the Langtang Valley (story coming soon) - and thought about plastic. Specifically plastic bottles of water that save us from dying of dehydration in countries like Nepal where tourists can't drink the tap water. Of course most of us would rather die of dehydration than buy a bottle of water at home. We all know it's bad for the environment in terms of the resources it takes to produce the bottles, the depletion of aquifers to fill them and the pollution problem of disposing of them. But when we travel we often do things we wouldn't do at home. on flights in refillable jugs? Who hasn't bought plastic 2-litre bottles of water in Thailand or Morocco, because we can't drink the tap water and, well, bottled water is cheap and convenient? 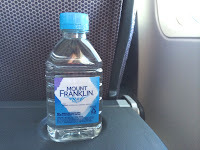 Or cracked open a tiny 300ml bottle tucked into the seatback pocket on a plane? Or said yes please to an ice-cold water bottle on a tropical tour bus? I know I have. Sure, plastic bottles are often re-used in countries like these, in creative ways. I've seen them used as hanging pots for plants, cut down to make lamps, turned into pipes on mountain streams. But the first rule of reducing plastic pollution is to, er, reduce (before reuse and recycle). What was heartening on my Nepal trek was that, with the exception of a couple of my fellow trekkers who bought plastic bottles of water every day (adding up to 50 or 60 empty bottles by the end of the trek), everyone in the group treated their drinking water in a variety of ways, to avoid buying plastic bottles. 1. Aquatabs. 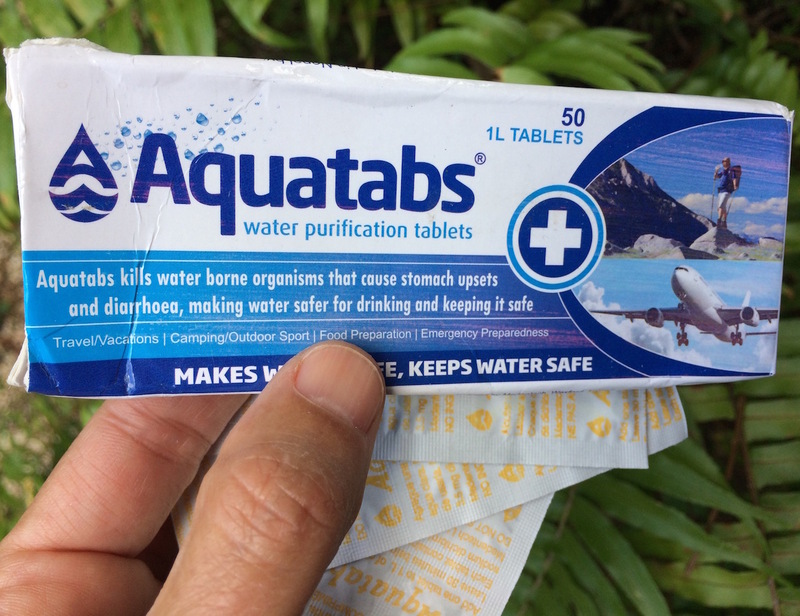 I used these tiny water purification tablets on the trek and they worked a treat. Filled my one-litre stainless steel water bottle from any tap, dropped in a pill, shook the bottle and waited 30 minutes before drinking. 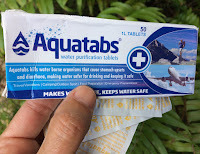 A pack of 50 Aquatabs costs about $10; I bought mine in Kathmandu (the city, not the outdoor store). 2. Lifestraw. 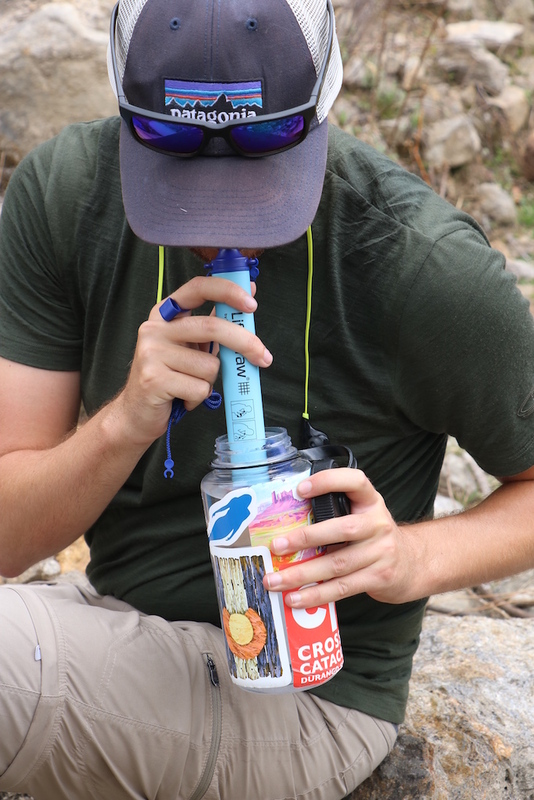 Designed by Swiss company Vestergaard in 2005 for use in countries where people don't have access to clean drinking water, the Lifestraw is basically a fat drinking straw that lets you safely drink from almost any water source. One straw can filter up to 4000 litres of water before it has to be replaced and costs about $40 from Macpac. There are also steel straws now and bottles with built-in Lifestraws. 3. SteriPEN. 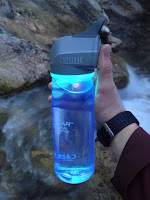 This one uses ultraviolet (UV) light to sterilise water; just fill your water bottle, stir it with the SteriPEN for 90 seconds (a green light signals when it's done) and you're ready to drink. Cities all over the world have long been using UV light to sterilise public water supplies, but US brand SteriPEN was the first to create a handheld UV device to purify water, in 2001. They start at $89 but the light lasts for 8000 litres. 4. CamelBak All Clear. CamelBak has taken things a step further by putting a UV filter in the lid of a BPA-free bottle, plus an LED screen that counts down the 60 seconds it takes to purify the water. It can be recharged by USB port, and a single charge purifies 60 litres of water. It's pricey at $199, but at least it's built into your bottle. 5. Chlorine dioxide. This one's my least favourite as it's a bit fiddly (I'd rather use Aquatabs). You add 12 droplets of Lifesystems chlorine dioxide solution to water and wait 20 minutes. The water tastes slightly better (less chlorine-y) than with Aquatabs, but there's always a risk the bottles could crack or leak their contents through your backpack. Costs about $30 from Trek&Travel. Remember to pack your reusable water bottle to use with all of these except #4 and you're good to go. Preferably stainless steel - it's better for you than even BPA-free plastic, more durable than most plastics and recyclable when you're finished with it. Two brands I've used and loved are The Source, which donates $2 of every sale to Sea Shepherd, and Sydney-based Cheeki. *Big thanks to Intrepid Travel for encouraging us all to reduce our use of bottled water on this amazing trek, in line with their strong sustainable travel stance, and for hosting me on the 15-day Tamang Heritage & Langtang Valley trek, which runs Feb-May and Oct-Nov every year. Great piece Lou. Although one of the thing travellers need to do is understand that tap water in many countries IS safe. It's amazing how many people 'reach for the bottle' in such places when travelling when they wouldn't at home. I've never used a filter (and spend a large chunk of my time in pretty grotty spots) but I might take it a bit further than most. For 2 weeks in Jordan recently, cycling most of the time in 30 degree temps, I did not use one bottle of bottled water and happily drank the tap water. My companions on that tour used probable 100 single use bottles plus in the same period. Even in Australia it doesn't help when land managers increasingly use 'Cover their a..se' signage and how readily people accept it. Only last week on the Larapinta Trail, most in the group refused to drink the beautiful rainwater from the tanks, due to signs advising trekkers to boil the water! National Parks/Councils etc seem to be doing this increasingly - not based on the actual quality of the water itself!